We've been clearing out another stall of the small barn, today, making room for the new chicks and some potential chicks from the five eggs that a broody hen is incubating for us at the moment. As I tipped a wheelbarrow-load of straw on to the compost heap, I noticed this delicate structure on the underside of the barrow. If you look hard (or click on the picture for a closer look), you can see the wasp larvae in the cells towards the bottom left. 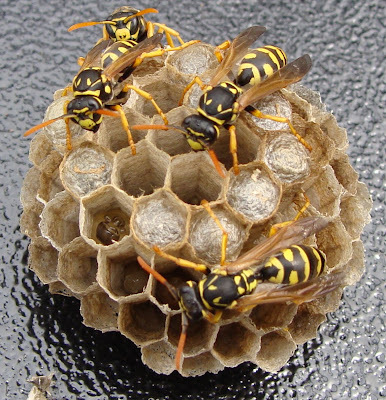 The wasp nest is really impressive, not in size, but because of the precise shape of the cells. One has to wonder where/how they learned that the hexagon is the most efficient shape for this sort of effort.